When digital advertising first emerged, technology seemingly offered a utopian future for marketers — the ability to deliver the right message to the right person at the right time. 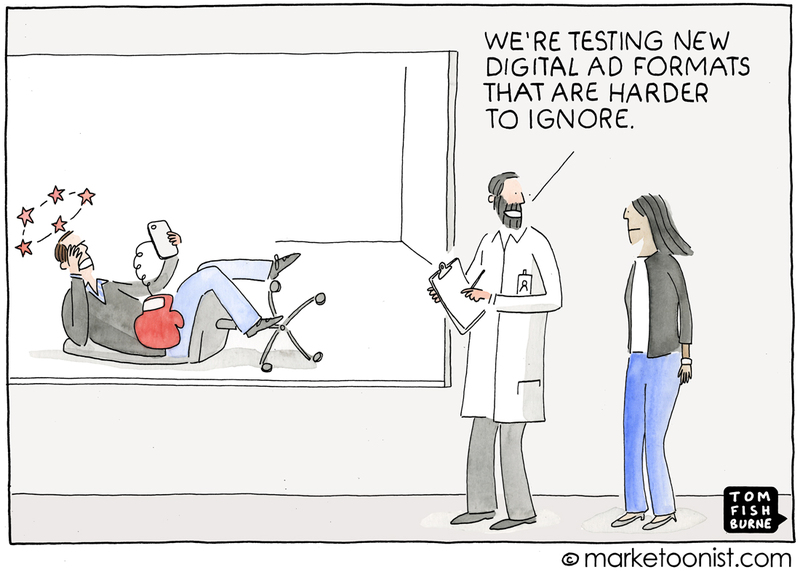 Marketers talked about an eventual end to one-size-fits-all advertising seen as irrelevant, interruptive, and annoying. Of course, one thing has changed. New technology in the form of Ad Blockers is allowing people to block ads altogether. The sudden rise of Ad Blockers (up 30% over last year to around 20% of users) has created a wake-up call in the industry. Marketers are referring to this as the “AdBlockAlypse”. Google announced last week that the Chrome browser would include a built-in ad blocker starting in early 2018. 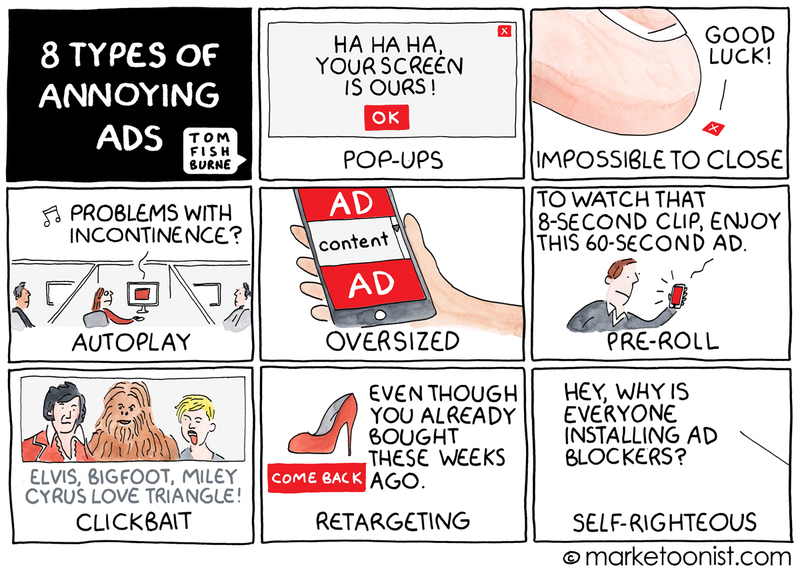 The ad blocker would be turned on by default and screen out what Google defines as some of the most annoying advertising tactics. This is a continuation of the work of The Coalition for Better Ads formed last year by Google, Facebook, Unilever, and P&G and others to clean up the digital advertising industry. This presents a massive challenge and opportunity for brands. 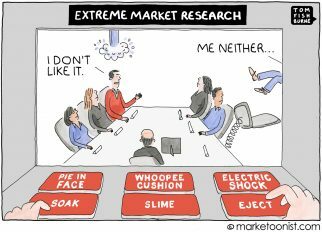 Just as technology makes it easier for marketers to reach their audiences, technology makes it easier for audiences to tune marketers out. Here’s a related cartoon I drew a couple years ago. Great piece Tom, and not limited to advertising. When the advertisers couldn’t sort things out on their own, the technologists decided to do it for them! Sometimes we (by that I mean marketers, brand/business owners) forget to step back and look at the world as a regular person. Do you like to be interrupted? Do you like something or someone getting between you and your intended goal/task? No, of course you don’t. If you had a “friend” that was regularly interrupting you, annoying you, keeping you from getting your “to do” list done, would you subsequently seek them out, or avoid them like the plague? You would be more likely to avoid them (except perhaps when desperate to have someone help you move a piece of furniture on a hot day) — of course! So why, when planning your A&P for your brand, would you ever authorize anyone to be that annoying, interrupting friend, that everyone wants to avoid? There’s really no good reason — even if on the shortest term it returns (which I challenge anyone to show me where these approaches really return REVENUE and not just clicks), I promise you, on the long term — this is no way to build a brand and business that people want and gravitate to — which is REALLY the path to long term revenue growth and brand success. As a user, the auto-play advertisements (or any content, really) are the absolute WORST. I will immediately close any tab that includes auto-played content and avoid that url like the plague in the future. 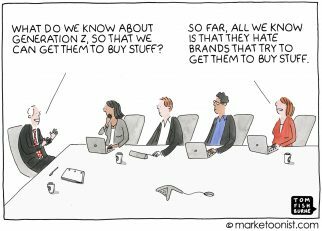 So its a big challenge to get the right offers to customers in the right context. Contextual ads are key, in my opinion. Something that augments the ‘right now’ task that a user is on. Me: Those One minute roll over ads when you want to watch a YouTube video are absolutely evil; how dare they interrupt me like this. Call the Police! Also Me; as a Marketeer: Those roll over ads are one of the best strategies to populate our client’s business. It’s just a matter of 60 secs.